On a grassy runway just outside of Madison, Grant Petty makes the final checks on his skeleton-framed airplane. Once ready, he hits the throttle and lurches forward. After a few 100 feet, the ultralight aircraft is airborne and climbing steadily, the scenery miniaturizing beneath Petty's feet. He will ultimately reach a cruising speed of around 40 mph. Petty is a professor of atmospheric science at the University of Wisconsin–Madison, and this flight is more than a hobbyist's joyride. It's part of a research project aimed at better understanding the Earth's atmosphere. Instruments strapped to the wings and the cockpit of the aircraft collect atmospheric data while it is airborne, gathering data from a part of Earth's atmosphere known as the boundary layer. "The ultralight, low-altitude aircraft can capture what's happening in the lower atmosphere where much of the turbulence is," says Ankur Desai, one of Petty's collaborators on the project in the Department of Atmospheric and Oceanic Sciences (AOS). "It's key to understanding coupling of the surface to the atmosphere in an experimental way." Coupling is the process of heat and moisture exchange between the Earth's surface and the atmosphere. Scientists study this exchange because it provides a window into our climate system. The ultralight aircraft may provide an ideal platform for measuring it since it can peer into parts of the atmosphere and capture measurements not otherwise possible with tools like satellites, ground-based instruments, or high-speed aircraft, like NASA's ER-2. "The onboard equipment includes ones similar to what you might find in a home weather-station: tools like an anemometer, thermometer, pressure and humidity sensors," says Desai. "Other equipment allows us to measure water fluxes, or evaporation off the surface, in addition to collecting data on land and surface properties." 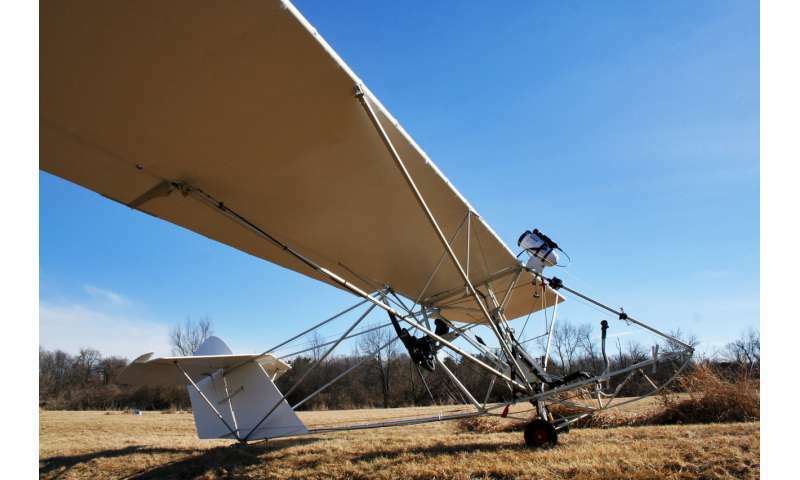 The UW Ultralight project came to fruition in the summer of 2017, when Petty (who is the principal investigator for the project) and UW–Madison Space Science and Engineering Center (SSEC) researcher Jonathan Thom got to work assembling the ultralight Zigolo MG12 craft. After three weeks of careful hand-assembly, Petty took the first test flight in August 2017, with a couple of "crow hops" – short takeoffs and immediate landings – until he felt comfortable ascending higher. Petty is currently the only pilot for the project but hopes to expand the program to include other experienced pilots who can help collect the atmospheric data needed by scientists. 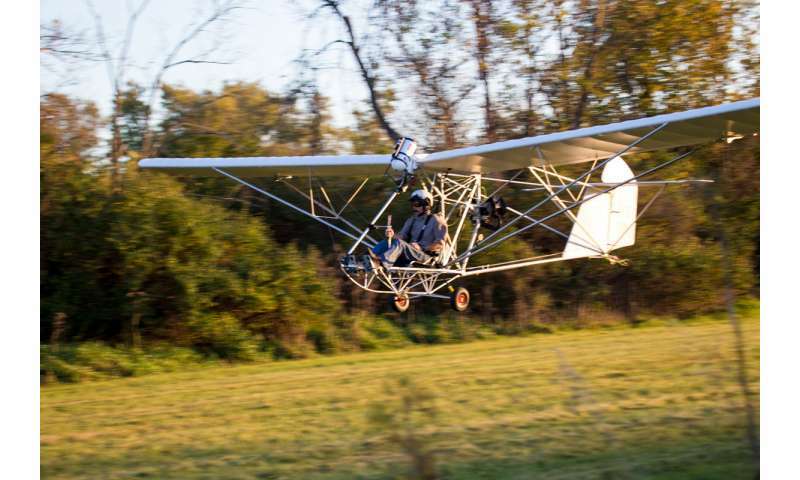 The team, which also includes AOS Professor Tristan L'Ecuyer, sees the ultralight as a way to fill gaps in our understanding about atmospheric physics. "Although the initial measurements will be focused on land-atmosphere couplings in Wisconsin, the goal is to eventually collect a diverse sample that can tell us, in greater detail, how the surface interacts with the atmosphere," says L'Ecuyer. "We're excited about the simplicity and ability to quickly adapt the instruments, flight paths, and science objectives based on what we're learning." The craft usually flies between 150-to-1,500 feet above the ground and can remain airborne for a little more than four hours on a full tank of gas. It weighs in around 485 pounds and can take off from short, unpaved runways less than 200 feet long. Commercial airline jets, by comparison, weigh more than 600,000 pounds and require more than 10,000 feet of runway for takeoff. However, with a load capacity of only 260 pounds, heavy onboard instruments present an engineering challenge for the project. It will require researchers to either design new instruments from the ground up or to reconfigure pre-built instrumentation to shed excess weight. The team plans to eventually convert the plane's 25-horsepower gasoline engine into an all-electric motor through a conversion kit, which will allow them to collect accurate pollution and particulate measurements without interference from exhaust. Other experiments include measuring evapotranspiration rates over agricultural fields (the process by which water is transferred from the soil and from plants into the atmosphere), moisture exchange from Madison's lakes, and winter flights over Lake Mendota's frozen surface. Using a new type of infrared measuring device, the ultralight will also serve as a testbed for NASA's Polar Radiant Energy in the Far Infrared Experiment (PREFIRE). Currently in the planning stages, PREFIRE will involve CubeSats – small satellites roughly the size of a loaf of bread – to collect data over the Arctic and measure frequencies in the far infrared part of the electromagnetic spectrum. This will allow scientists to measure energy emissions from the Arctic, a rarely-studied part of the energy cycle there, and can be used to better predict how fast Arctic snow and ice will melt. By flying winter transects over Madison's frozen lakes, L'Ecuyer says the ultralight will be used to collect the data needed for calibration and other comparative studies as the PREFIRE program is developed. "We are looking forward to accommodating researchers across campus who maybe can't afford projects with high-end planes but could use the data available to us," Petty says. "We're excited to see what people come up with for ideas and uses for this platform."